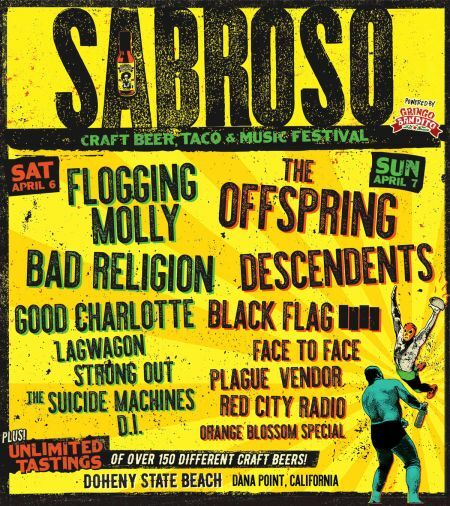 Sabroso Craft Beer, Taco and Music Festival is back this year with a stellar punk rock line up. Headlining the Southern California festival are Offspring, Flogging Molly, Bad Religion and Descendants. Other acts on the bill include The Vandals, Sum 41, Black Flag, Strung Out, and Dwarves. Sponsored by Offspring singer Dexter Holland’s hot sauce brand Gringo Bandito, Sabroso festival will extend from one to two days after selling out its first two years. The festival will also hit the road for single day shows in Fort Worth, Salt Lake City, and Denver in April. Produced by music festival production company Synergy Global Entertainment, Inc. (SGE) and craft beer festival producer Brew Ha Ha Productions, the festival takes place from April 6-7 at Doheny State Beach in Dana Point, California (Tickets). Find all the dates below. Aside from music, the event will also feature craft beer tastings (until 4:00 P.M.) from some of the best breweries in the country, and tacos from the region's top chefs and restaurants will be available for purchase. Those who attend will also get the chance to taste all flavors of Dexter Holland's signature hot sauce. You'll also be able to take in some Lucha Libre style wrestling along with lawn games, contests, and more. Tickets for all tour dates of Sabroso Craft Beer, Taco & Music Festival go on sale Friday, Feb. 15 at 10:00 AM local time at www.SabrosoTacoFest.com. VIP tickets will also be available. You can also get tickets at AXS here.